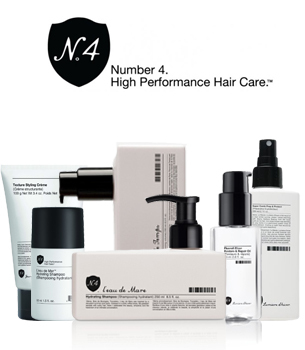 The Number 4 High Performance Hair Care collection was formulated to develop a hair care line of products that can measure up to the latest creative trends in fashion, the arts, science and industrial design. This creative line of hair care products was founded by combining the best in natural ingredients and using the latest technological innovations to ensure an appearance that defines and carves out new stylistic arenas. Number 4 rejects any ingredient that can be toxic to humans or the environment and nothing is ever tested on animals. The company is dedicated to producing products that are 100% Vegan, free of sulfates and sodium chloride, gluten-free, and paraben-free. Their miracle product, Liquid Complex Culture, uses pure water and an advanced delivery system that uses botanical ingredients to form tiny molecules which, in turn, creates exceptional anti-aging, anti-color-fading, strengthening and liberating results. Discover the products that make Number 4 stand out from other run-of-the-mill hair products. Purify and cleanse hair with Number 4’s Clarifying Shampoo, then infuse tresses with the Reconstructing Masque to feed on soy proteins, Vitamin B5 and natural conditioners for a heavenly shine. Number 4 has you covered with their Essential, Style, Volume, Hydrate, Kits and Minis Collections.